UP Board 4.69 Lakh Students Failed:-Latest News 19 March During verification of UP Board copies 4.69 Lakh Students failed. These students are those who left the examination due to strict rule of Video Camera, Lots of Centers Examination sits in the examination hall this will led to many students who take only admission for pass their dream becomes nightmare now. To give good display Image of current ruling party name BJPs CM Adityanath Nath Yogi said no cheating allowed in exam. UP Board 10th 12th Students Failed List: - According to new passing rule in UP Board exam of High school and Intermediate. If Students Failed in 1 subjects or Unable to attend the exam due to certain reason than he or she automatically called as failed students in UP. 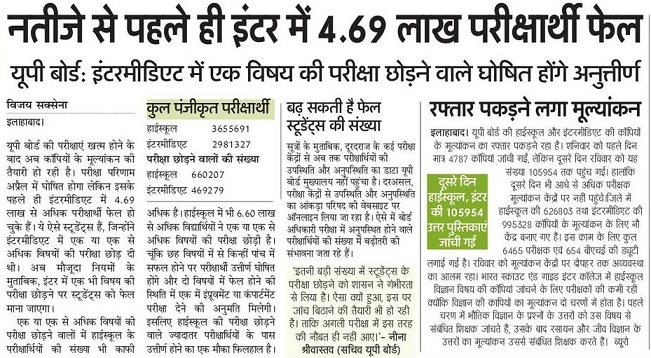 It is estimated that 4.69 Students Failed in Class 12th, 6.60 Lakh Students Failed in Metric Exam of UP Board. How to Pass in UP Board Exam 2019:- However Number of Failed students will be increases day by day which crosses up to 15 Lakh. So we will give you 1 advice to change your failed result in passing result. For this fill the form of Compartment/Improvement exam upcoming in June July August Month. 1. Candidates failed in two subject than candidate is eligible to fill 1 Subject improvement form in UP Board. UP Board Sachiv Nina Shrivastav also discussing about why so many candidates are failed in 2018 exam of UP Board.